Fish Tank Friday: Blowfish | OhGizmo! This fish tank is a real object, designed for a real (albeit conceptual) purpose. I’ll tell you all about it after the jump. But first, take a good look at that picture, and see if you can guess what you think is going on… From the perspective of the girl, or the fish. My first thought? Those fish are in trouble, ’cause that girl is thirsty. The project raises questions about how children might use their own fantasies and dreams to imagine an alternative genetic future, and questions whether it is adults or children who are really in control of the technology. The prototypes I have created help to materialise an imaginary future in which a child’s ability is considered before birth and influenced via training and parental supervision throughout development. More specifically, I have explored the possibility of a genetic modification which enables children to absorb higher levels of oxygen, thus enhancing concentration, focus and calmness as well as improving athletic ability and improving general health. The children were asked to imagine the implications of a modification to the H1FA gene, one of the seven oxygen sensing genes, which would enable them to survive for longer with less oxygen. The main benefit from the perspective of the children was the prospect of being able to swim and survive under water for longer, and being able to change their interactions with one another as a result of this new imagined world. 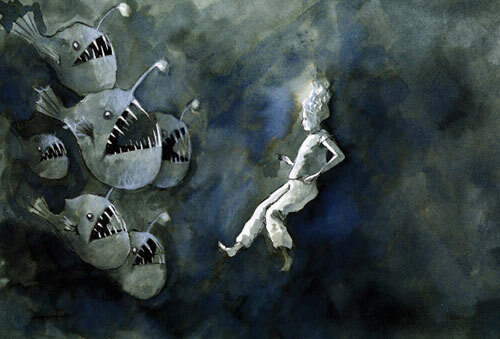 During a brainstorm, the children imagined sea creatures they wished they could become. Bizarre. Almost as bizarre as this fish tank… Almost. I read this post 3 times and i dont understand what its saying or the purpose of the experiment……. This tank wouldn't survive in my household. Somebody will definetly “macgyver” a compresson into that. Just to see, what would happen. Children are like clay. The best time for them to learn and discover and dream is before someone crushes everything by telling them they can't or that something is impossible. Children are open to many possibilities that adults have let go of long ago. So what does this fish tank have to do with it again? I'm confused… What is this for??? I mean it doesn't even really look that cool. 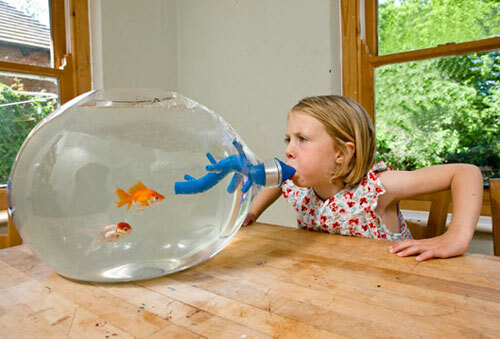 I agree, is the child suppose to pretend they are breathing in air from the bubble? or is she blowing air into it? Her cheeks look puffy. I'm so lost. I get it's experiments to get into the creative minds of children, but how with that? Rush this person to the nearest insane asylum. I thought she was blowing bubbles into the tank, to interact and play with the fishies. I never imagined it'd be as complex a description as it turned out to be. I thought this kid was aerating the fish tank because it didn't have an air pump in an attempt to be some sort of eco-friendly fish tank. I love how the first fish the kids want to meet when they become genetically modified is an angler fish, didn't they see Finding Nemo? Im glad after reading the post that i was not the only one who didn't get the picture. I thought it was an elastic fish bowl that you blew in to make it bigger. but its not. …………………………………………………..’, ; ; ; ; ; ; ‘-,__,\–\.